This period of the war saw the initial civil uprising take on many of the characteristics of a civil war, according to several outside observers, including the United Nations Commission on Human Rights, as armed elements became better organized and began carrying out successful attacks in retaliation for the crackdown by the Syrian government on demonstrators and defectors. In early 2012, Kofi Annan acted as the UN–Arab League Joint Special Representative for Syria. His peace plan provided for a ceasefire, but even as the negotiations for it were being conducted, the rebels and the Syrian army continued fighting even after the peace plan. :11 The United Nations-backed ceasefire was brokered by special envoy Kofi Annan and declared in mid-April 2012. The civil uprising phase of the Syrian Civil War was an early stage of protests – with subsequent violent reaction by the Syrian Arab Republic authorities – lasting from March to 28 July 2011. The uprising, initially demanding democratic reforms, evolved from initially minor protests, beginning as early as January 2011 and transformed into massive protests in March. The uprising was marked by massive anti-government opposition demonstrations against the Ba'athist government of Bashar al-Assad, meeting with police and military violence, massive arrests and brutal crackdown, resulting in hundreds of casualties and thousands of wounded. The civil uprising phase created the platform for emergence of militant opposition movements and massive defections from the Syrian Army, which gradually transformed the conflict from a civil uprising to an armed rebellion, and later a full-scale civil war. The rebel Free Syrian Army was created on July 29, 2011, marking the transition into armed insurgency. During the June 2011 Jisr ash-Shugur operation, the Syrian army claimed to have begun a crackdown on terrorists between June 4 and June 12, which left 120–140 security personnel dead. On 29 July 2011, seven defecting Syrian Armed Forces officers formed the Free Syrian Army (FSA), originally composed of defected Syrian military officers and soldiers, aiming "to bring this government (the Assad government) down" with united opposition forces. On 31 July, a nationwide crackdown nicknamed the "Ramadan Massacre" resulted in the death of at least 142 people and hundreds of injuries. On 23 August, a coalition of anti-government groups called the Syrian National Council was formed. The council, based in Turkey, attempted to organize the opposition. The opposition, however, including the FSA, remained a fractious collection of political groups, longtime exiles, grassroots organizers and armed militants divided along ideological, ethnic and/or sectarian lines. Lt. Col. Hussein Harmoush, founder of the Free Officers Movement of Syria. Harmoush was captured by government forces in August 2011, detained at Sednaya Prison and probably executed. Throughout August 2011, government forces stormed major urban centres and outlying regions, and continued to attack protests. On 14 August, the Siege of Latakia continued as the Syrian Navy became involved in the military crackdown for the first time. Gunboats fired heavy machine guns at waterfront districts in Latakia, as ground troops and security agents backed by armour stormed several neighbourhoods. The Eid ul-Fitr celebrations, which began at the end of August, were muted after security forces fired on protesters gathered in Homs, Daraa, and the suburbs of Damascus. By September 2011, Syrian rebels were engaged in an active insurgency campaign in many parts of Syria. A major confrontation between the FSA and the Syrian Armed Forces occurred in Al-Rastan. From 27 September to 1 October, Syrian government forces, backed by tanks and helicopters, led an offensive on the town of Al-Rastan in Homs Governorate, in order to drive out army defectors. The 2011 Battle of Rastan between government forces and the FSA was the longest and most intense action until that time. After a week, the FSA was forced to retreat from Rastan. To avoid government forces, the leader of the FSA, Colonel Riad Asaad, retreated to Turkey. Many of the rebels fled to the nearby city of Homs. By October 2011, the FSA started to receive active support from the Turkish government, which allowed the rebel army to operate its command and headquarters from the country's southern Hatay Province close to the Syrian border, and its field command from inside Syria. In October 2011, clashes between government and army units which had defected were being regularly reported. During the first week of the month, sustained clashes were reported in Jabal al-Zawiya in the mountains of Idlib Governorate. Syrian rebels also captured most of Idlib city. In mid-October, clashes in Idlib Governorate included the towns of Binnish and Hass in the governorate near the mountain range of Jabal al-Zawiya. In late October, clashes occurred in the northwestern town of Maarrat al-Nu'man between government forces and defected soldiers, and near the Turkish border, where 10 security agents and a deserter were killed in a bus ambush. It was not clear if the defectors linked to these incidents were connected to the FSA. According to defectors, in 2011 the Syrian government intentionally released imprisoned Islamist militants and provided them with arms "in order to make itself the least bad choice for the international community", though the "claims could not be independently verified" of the one defector quoted, who "did not have documents supporting" the allegations." On 19 October 2011 U.S. media reported that "large crowds of Syrians rallied in the northern city of Aleppo in support of the government of President Bashar al-Assad". The Syrian government estimated over a million pro-government demonstrators, while others estimated crowds at least "tens of thousands" comparable in size to a pro-government rally "a week earlier in Damascus." 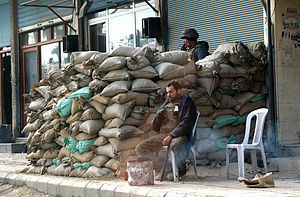 In early November 2011, clashes between the FSA and security forces in Homs escalated as the siege continued. After six days of bombardment, the Syrian Army stormed the city on 8 November, leading to heavy street fighting in several neighborhoods. Resistance in Homs was significantly greater than that seen in other towns and cities, and some in opposition have referred to the city as the "Capital of the Revolution". Unlike events in Deraa and Hama, operations in Homs failed to quell the unrest. November and December 2011 saw increasing rebel attacks, as opposition forces grew in number. In the two months, the FSA launched deadly attacks on an air force intelligence complex in the Damascus suburb of Harasta, the Ba'ath Syrian Regional Branch youth headquarters in Idlib Governorate and Damascus, an airbase in Homs Governorate, and an intelligence building in Idlib. On 15 December, opposition fighters ambushed checkpoints and military bases around Daraa, killing 27 soldiers, in one of the largest attacks yet on security forces. The opposition suffered a major setback on 19 December, when a failed defection in Idlib Governorate lead to 72 defectors killed. In December 2011, The American Conservative cited former counter-terrorism specialist and CIA military intelligence officer Philip Giraldi that already "unmarked NATO warplanes are arriving at Turkish military bases close to the Syrian border, delivering weapons from the late Muammar Gaddafi’s arsenals as well as volunteers from the Libyan Transitional National Council who are experienced in pitting local volunteers against trained soldiers" and that in addition, "French and British special forces trainers are on the ground, assisting the Syrian rebels while the CIA and U.S. Spec Ops are providing communications equipment and intelligence to assist the rebel cause." Giraldi stated that "CIA analysts are skeptical regarding the march to war" for reasons including that "the frequently cited U.N. report that more than 3,500 civilians have been killed by Assad’s soldiers is based largely on rebel sources and is uncorroborated" while cautioning that "Americans should be concerned about what is happening in Syria... It threatens to become another undeclared war like Libya but much, much worse." In January 2012, Assad began using large-scale artillery operations against the insurgency, which led to the destruction of many civilian homes due to indiscriminate shelling. By this time, daily protests had dwindled, eclipsed by the spread of armed conflict. January saw intensified clashes around the suburbs of Damascus, with Syrian Army use of tanks and artillery becoming common. Fighting in Zabadani began on 7 January when the Syrian Army stormed the town in an attempt to root out the FSA presence. After the first phase of the battle ended with a ceasefire on 18 January, leaving the FSA in control of the town, the FSA launched an offensive into nearby Douma. Fighting in the town lasted from 21 to 30 January, before the rebels were forced to retreat as result of a government counteroffensive. Although the Syrian Army managed to retake most of the suburbs, sporadic fighting continued. Fighting erupted in Rastan again on 29 January, when dozens of soldiers manning the town's checkpoints defected and began opening fire on troops loyal to the government. Opposition forces gained complete control of the town and surrounding suburbs on 5 February. On 3 February, the Syrian Army launched a major offensive in Homs to retake rebel-held neighborhoods. In early March, after weeks of artillery bombardments and heavy street fighting, the Syrian Army eventually captured the district of Baba Amr, a rebel stronghold. By the end of March, the Syrian Army retook control of half a dozen districts, leaving them in control of 70 percent of the city. By 14 March, Syrian troops successfully ousted insurgents from the city of Idlib after days of fighting. By early April, the estimated death toll of the conflict, according to activists, reached 10,000. In April 2012, Assad forces began employing attack helicopters against rebel forces. The United Nations-backed ceasefire was brokered by special envoy Kofi Annan and declared in mid-April 2012, but eventually met a similar fate, with unarmed UN peacekeepers' movements tightly controlled by the government and fighting. By early June 2012, the civil war entered its most violent phase, with fighting spreading all across the country and fatalities mounting in unprecedented numbers. Incommunicado detention, including of children, also continued. ^ Though the Syrian Army officially comprised around 220,000 soldiers at the start of the insurgency, including active and reserve personnel, more than half of these troops either defected to the insurgents or refused to answer calls of mobilization. As result, the army was limited to about 60,000 men in 2011. ^ "Defecting troops form 'Free Syrian Army', target Assad security forces". The World Tribune. Retrieved 13 November 2011. ^ "Syrian Rebels Plot Their Next Moves: A TIME Exclusive". TIME. 11 February 2012. ^ Staff, By the CNN Wire. "Sources: Annan, Clinton to meet about Syria - CNN.com". ^ "Lebanon's Most Wanted Sunni Terrorist Blows Himself Up in Syria". Yalibnan. 23 April 2012. Retrieved 17 May 2012. ^ Cooper (2015), p. 13. ^ Cooper (2015), p. 20. ^ a b Cite error: The named reference SOHR was invoked but never defined (see the help page). ^ Cite error: The named reference syriangovernment1 was invoked but never defined (see the help page). ^ Cite error: The named reference syriangovernment2 was invoked but never defined (see the help page). ^ Cite error: The named reference Violations Documenting Center was invoked but never defined (see the help page). ^ Hanania, Ray (6 April 2012). "Syria Medical Crisis Relief Efforts To Be Held At The Suburban Collection Showplace". Aams.blogspot.com. Retrieved 10 April 2012. ^ a b "Deadly Reprisals: deliberate killings and other abuses by Syria's armed forces". Amnesty International. June 2012. Retrieved 25 June 2012. ^ "Syria vows 'decisive' response in Jisr al-Shughour". BBC News. 7 June 2011. Retrieved 19 June 2018. ^ Karouny, Mariam (6 June 2011). "Syria to send in army after 120 troops killed". Reuters. Retrieved 19 June 2018. ^ Sly, Liz (6 June 2011). "Syria says protesters killed 120 soldiers". The Washington Post. Retrieved 19 June 2018. ^ Landis, Joshua (29 July 2011). "Free Syrian Army Founded by Seven Officers to Fight the Syrian Army". Syria Comment. Retrieved 29 May 2014. ^ "Defecting troops form 'Free Syrian Army', target Assad security forces". World Tribune. 3 August 2011. Retrieved 29 May 2014. ^ "Syrian army kills at least 95 in Hama: activist". Dawn. Agence France-Presse. 31 July 2011. Retrieved 7 June 2015. ^ Barnard, Anne; Hubbard, Ben. "Syria News". The New York Times. Retrieved 2 August 2012. ^ Rania Abouzeid (15 September 2011). "In Blow to Opposition, a Dissident Syrian Army Officer is Captured". TIME. Retrieved 24 September 2017. ^ "Mass Torture Photo is likely for Hussein Harmoush". Zaman al-Wasl. 1 February 2015. Retrieved 24 September 2017. ^ Oweis, Khaled Yacoub (14 August 2011). "Tank, navy attack on Syria's Latakia kills 26-witnesses". Amman. Reuters. Retrieved 14 August 2011. ^ "Syrian forces kill seven protesters as Muslims celebrate first day of Eid". Al Arabiya. 30 August 2011. Retrieved 1 February 2012. 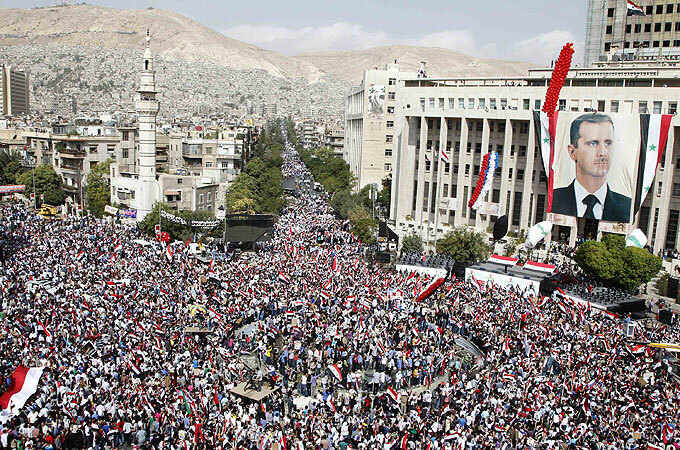 ^ "Syria: 'Hundreds of thousands' join anti-Assad protests". BBC. 1 July 2011. Retrieved 3 August 2011. ^ Oweis, Khaled Yacoub (4 October 2011). "Dissident Syrian colonel flees to Turkey". Reuters. Retrieved 18 August 2012. ^ Yezdani, İpek (1 September 2012). "Syrian rebels: Too fragmented, unruly". Hürriyet Daily News. Retrieved 21 September 2012. ^ "Syria sends extra troops after rebels seize Idlib: NGO". Ahram. ^ "Activists: Syrian forces fight defectors; 5 killed". The Hindu. Chennai, India. Associated Press. 17 October 2011. Retrieved 23 May 2012. ^ "Assad forces fight deserters at northwestern town". Reuters. 25 October 2011. Retrieved 8 August 2013. ^ "11 troops killed as UN chief urges end to Syria violence". NDTV. Agence France-Presse. 18 October 2011. Retrieved 22 July 2013. ^ Sands, Phil; Vela, Justin; Maayeh, Suha (21 January 2014). "Assad regime set free extremists from prison to fire up trouble during peaceful uprising". The National. Retrieved 11 August 2014. ^ Weiss, Michael (23 June 2014). "Trust Iran Only as Far as You Can Throw It". Foreign Policy. Retrieved 11 August 2014. ^ "Pro-Assad Rally Shows Syrian Government Can Still Command Support". The New York Times. 20 October 2011. ^ Bakri, Nada (20 November 2011). "New Phase for Syria in Attacks on Capital". The New York Times. Retrieved 10 August 2013. ^ Bakri, Nada (15 December 2011). "Syrian Army Defectors Reportedly Kill 27 Soldiers". The New York Times. ^ "Syria unrest: Dozens of army deserters 'gunned down'". BBC. 20 December 2011. ^ a b "Observations on the Air War in Syria" (PDF). Air & Space Power Journal. March–April 2013. ^ Neil MacFarquhar (26 October 2012). "Syrian Protesters Emerge Amid Clashes and Bombing During a Holiday Cease-Fire". The New York Times. Retrieved 16 January 2014. ^ Sly, Liz (21 January 2012). "Syria's Zabadani is 'liberated', but for how long?". The Washington Post. ^ Smaan, Maher; Barnard, Anne (16 September 2015). "Para los que aún viven en Siria, la rutina está marcada por el miedo y el horror". The New York Times (in Spanish). ^ Yacoub, Khaled (30 January 2012). "Assad troops fight back against Syria rebels". Reuters. Retrieved 8 August 2013. ^ "Syria – Mar 4, 2012 – 11:48". Al Jazeera. 4 March 2012. ^ "Syria 'more than 11,000 killed in 13 months'". The Telegraph. London. Telegraph Media Group Limited. 16 April 2012. Retrieved 7 June 2015. ^ "Syrian troops retake opposition stronghold". Al Jazeera. 14 March 2012. ^ "Syria agrees to Kofi Annan's April 10 peace deadline, UN Security Council told". Metro. 2 April 2012. This page was last edited on 14 January 2019, at 02:57 (UTC).